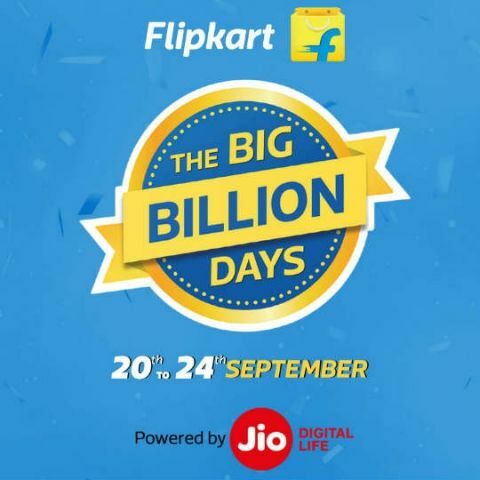 Flipkart is all geared up for hosting its Big Billion Day sale. The sale will commence from September 20 and will continue till September 24. The electronics sale kicks off a day later on September 21 and we take a sneak peek at the products that will receive discounts in the sale. Flipkart will offer discounts on various laptops segments such as the Intel Core i3 and Core i5 laptops. The e-commerce platform has not yet revealed the amount of discount being offered yet. The Acer Predator gaming laptop with Core i5 processor will also be offered at a discounted price. Consumers can get up to Rs 20,000 off on laptops via the laptop exchange offer. Apple’s iPad with varying configurations and Apple’s wireless AirPods will also be up for grabs on slashed prices during the sale. Gaming enthusiasts can grab the 1TB Sony PS4 slim, which will be available at a discounted price. Talking about smartphones, the Big Billion Day sale will offer the newly launched ZenFone 4 Selfie. The smartphone is priced at Rs 14,999, but will be available for Rs 13,999 during the sale. The Yu Yureka 2 will exclusively be launched in the sale for Rs 11,999, it is priced at Rs 13,999. The sale is teasing "Hero deals" on budget mobile phones, which is expected to offer budget friendly phones at lower prices. Apart from smartphones, accessories such as phone cases and covers, chargers, power banks and storage devices will also be on sale and can be expected at a discounted prices. Many TV’s ranging across various screen sizes and features will be available for grabs on the Big Billion Day sale. Smart TV’s along with UHD TV’s are also expected to get a price cut during the sale. Users will be able to avail 10 percent instant discount using an SBI debit and credit card and some products will be available with Flipkart’s buyback guarantee. Flipkart is also offering No Cost EMIs, Debit Card EMIs, Product Exchange offers, Buyback Guarantee, Buy Now, Pay Later. Bajaj Finserv will offer no cost EMI on credit cards and users can avail up to 10 percent cash back with PhonePe. Many more offers can be expected during the sale.